A pair of slippers and a headband for a little princess, sadly the slippers didn’t fit her (although I did make it for a year old size). I still have to make another pair for her and it’s been a month. I know I am being lazy but it looks like I am slowly getting my mojo back and soon I’ll update on this project. 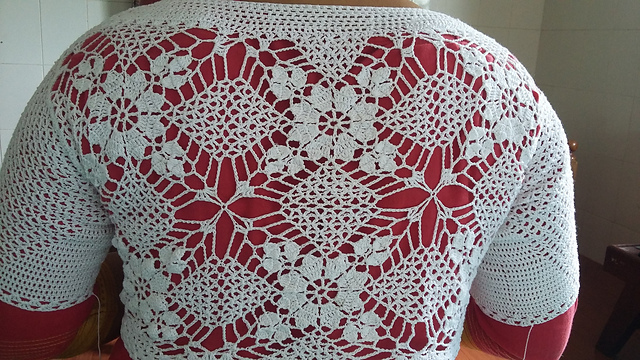 A lace shrug made on request for Bhabhi. Sadly after washing I realised that the underarms are not going to fit her and so again I have to start a new one. I am still not sure about what to do with it. Just finished knitting a dress for my daughter, which completes my New Year gift for both. Aaku’s dress was ready by Jan. end but I couldn’t post earlier. Both the dresses are test knit for chashmerejunkie on Ravelry. Simple patterns, seamless designs, top down with a lot of positive ease. I had been enjoying sewing lately, had tried a lot of stuff. as expected mostly for my daughters..